A family favorite for decades, Lawryâ€TMs signature Seasoned Salt features an expert blend of salt and natural herbs and spices, including paprika, turmeric, onion and garlic. Lawryâ€TMs Seasoned Salt is a versatile kitchen staple for adding flavor to almost any recipe â€" whether itâ€TMs breakfast, lunch or dinner. Shake on beef, pork and poultry before and after cooking. Mix into ground beef for bold burgers. Add to fries and baked or mashed potatoes. Or sprinkle on salads, vegetables, soups and sauces. This listing is for 2 x 40 Ounce Container of Lawry's Seasoned Salt. We keep our products stored properly and in stock ready to ship. You can feel at ease knowing you will receive your product fresh and on time. There's a reason why our signature seasoned salt has been a family favorite for decades. The expert blend of salt, herbs and spices adds unique flavor to any meal you're inspired to make. Mix into ground beef for bold burgers. Add to fries and baked or mashed potatoes. Or sprinkle on salads, vegetables, soups and sauces. 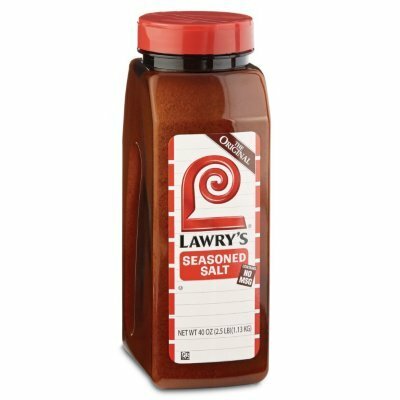 Lawrys Seasoned Salt has been a family favorite for decades. With its perfect blend of natural flavors, including salt, sugar and spices like paprika, turmeric and garlic, this seasoning is a simple way to deliver satisfying meals in a pinch. It's amazing what a little Lawry's flavor can do. Whether you are preparing chicken, steak, pork or seafood, Lawry's seasoned salt, marinades, spice blends and recipe mixes help you create inventive and flavorful meals in a flash. No mixing, no measuring, no fuss, great for adding delicious flavor when you are short on time.